This week’s winner of our #UJBXMAS photo contest on Instagram is an obvious one. It was hard to miss her colorful vintage ornaments and succulents on Instagram this week. Without further ado: it is Anuschka, stylist and photographer from Hipaholic! We asked her a few questions about her green and colorful holiday decoration. Where did your love for vintage ornaments come from? I love vintage stuff in general. I guess my love for vintage ornaments comes from the seventies when I was a child and we had those ornaments in the Christmas tree. It brings me back to those days. I also love the colors and details of the vintage ornaments. I’ve been collecting them for years. I found most of my ornaments at Marktplaats (Dutch Craigslist), thrift shops or I get them from friends. My favorite is a set of houses and the box where they are in. I love the neon colors and the glitters on them. Do you have more green Christmas decoration at home? What do you wish for 2015? My wish for 2015 is that I can continue doing what I do with Hipaholic now: make a lot of nice pics and inspire others! You can see more from Anuschka on Hipaholic and her Instagram. Do you have more green festive decor ideas? 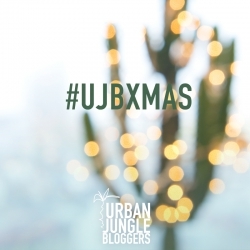 If so share them with us on Instagram using the hashtags #ujbxmas and #urbanjunglebloggers. Next Monday we will announce our fourth and last winner here!